Monday's performance, attended by Prince Charles, honours two Canadian soldiers killed earlier this month. Two recently killed Canadian soldiers are top of mind Monday night as the National Arts Centre Orchestra musicians prepare for the London stop of their 10-day U.K. remembrance tour. The tour is intended to honour the sacrifice made by Canadian soldiers who died in the First World War. It's now also dedicated to Canadian military personnel who lost their lives in recent violent attacks in Ottawa and St-Jean-sur-Richelieu, Quebec. 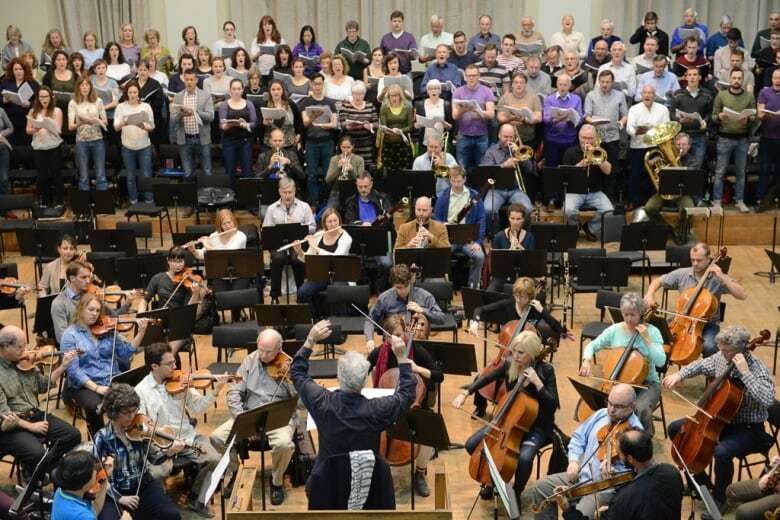 London Philharmonic Choir and the NAC Orchestra rehearse under the baton of Pinchas Zukerman ahead of their concert Monday night at London Royal Festival Hall. (Fred Cattroll, NAC Photographer)Monday night's performance of NACO together with London's Royal Philharmonic Orchestra will be attended by Prince Charles and will include a special tribute to Corporal Nathan Cirillo and Warrant Officer Patrice Vincent. "While this tour was originally designed to look at the past, our thoughts are very much in the present this morning, and of course, the heartbreak that has engulfed our own country of Canada," said Rosemary Thompson, a spokesperson for the National Arts Centre. NACO already dedicated the previous performances of their tour to Cirillo, who was slain in front of the War Memorial, just across the street from the orchestra's home at the National Arts Centre in downtown Ottawa. Monday night's performance, at London's Royal Festival Hall, is a culmination of a full day of activities for NACO members—a day that included a stop at the London Zoo. 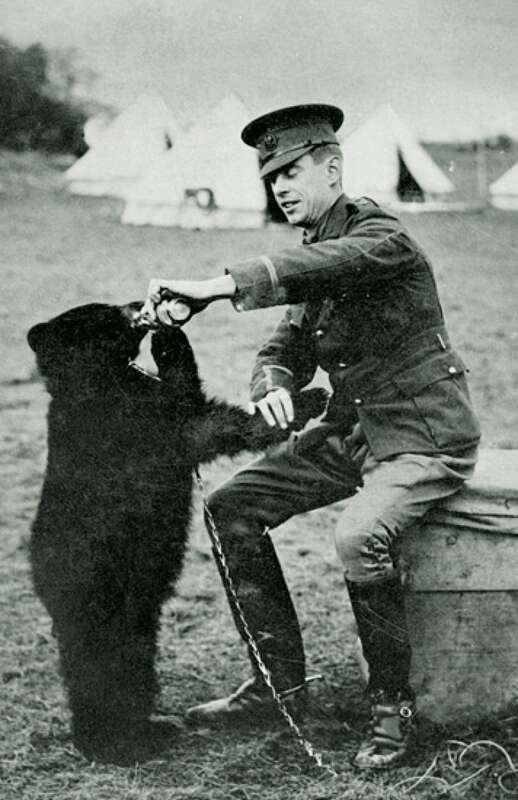 A century ago, Canadian soldier Lt. Harry Colebourne donated his beloved pet bear "Winnie" (named after his hometown of Winnipeg) to the Zoo, as he went off to fight in France. Harry Coleborne donated his pet bear "Winnie" to the London Zoo before going off to fight in France during the First World War. (Manitoba Provincial Archives)The bear became a popular fixture at the Zoo, eventually catching the eye of one A.A. Milne and his son, Christopher Robin. Soon, popular children's character Winnie the Pooh was born. Colebourne's great-granddaughter Lindsay Mattick, an author of an upcoming children's book Finding Winnie, visited the statue of Winnie the Pooh at the Zoo. "I feel really lucky and honoured to have this opportunity to literally retrace the steps of my great grandfather who I never had the chance to meet but have a great deal of admiration for," said Mattick. After tonight's show in London, NACO's tour of the United Kingdom continues with a performance at the historic Salisbury Cathedral on October 29th. That performance will be broadcast on CBC Radio 2 o​n Nov​. 9th and 11th and featured on CBC Television as part of its Remembrance Day coverage. An hour-long broadcast of the Salisbury Cathedral concert will be broadcast by CBC Television during the holiday season in December.